What is V model in testing? 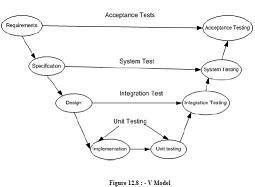 V model map�s the type of test to the stage of development in a project. Starting from the bottom the first test level is "Unit Testing". It involves checking that each feature specified in the "Component Design" has been implemented in the component. In theory an independent tester should do this, but in practice the developer usually does it, as they are the only people who understand how a component works. The problem with a component is that it performs only a small part of the functionality of a system, and it relies on co-operating with other parts of the system, which may not have been built yet. To overcome this, the developer either builds, or uses special software to trick the component into believe it is working in a fully functional system. tests, when connected to each other produce one new component full of faults. These tests can be done by specialists, or by the developers. Once the entire system has been built then it has to be tested against the "System Specification" to check if it delivers the features required. It is still developer focused, although specialist developers known as systems testers are normally employed to do it. In essence System Testing is not about checking the individual parts of the design, but about checking the system as a whole. In fact it is one giant component. The customer should always do acceptance testing and not the developer . The customer knows what is required from the system to achieve value in the business and is the only person qualified to make that judgment. This testing is more of getting the answer for whether is the software delivered as defined by the customer. It�s like getting a green flag from the customer that the software is up to the expectation and ready to be used.